What if we told you that you could tighten your client’s skin while diminishing their fine lines for a rejuvenated and lifted face? A new non-surgical treatment for skin tightening from Cynosure called TempSure™ can do just that, and all it takes is 20 minutes! Skin care specialists and clients love this treatment since it can tighten skin without using a scalpel! 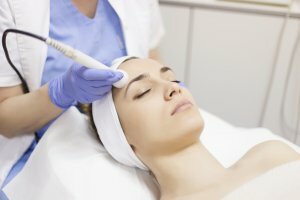 Since its FDA-approval, the cosmetic treatment has been adopted by several skin care specialists and businesses looking to diversify their skin rejuvenation modalities beyond cosmetic lasers and injections. Now, medical aesthetics training schools like National Laser Institute are incorporating this new non-surgical treatment for skin tightening into its training courses. TempSure is an RF treatment that has several benefits: It can minimize fine lines and wrinkles, as well as improve cellulite. This procedure is optimal if you want to tighten skin without using a scalpel! Several radiofrequency treatments have existed in the beauty field for years, but TempSure has a distinct advantage. The device links treatment time with a target temperature, allowing for consistent treatment and high patient comfort levels. Another benefit of this new non-surgical treatment for skin tightening ]is it can be administered year-round since it utilizes radiofrequency technology. It is also safe for any skin type and levels of sun exposure. How does TempSure work? The handheld device emits radio frequency waves to heat the skin gently. Increasing the skin’s temperature for a defined, therapeutic time tricks the body into thinking it’s injured, so growth factors are sent to the treated area to build new collagen. This gives your clients tighter, younger-looking skin. Skin toning RF is intended for frown lines, forehead lines, crow’s feet, smile lines, wrinkles and cellulite on the body. A non-surgical treatment for skin tightening can be performed in under 45 minutes, making it a great lunchtime option. Clients will be able to return to their daily activities immediately following the procedure! Are you ready to enter the exciting $16 BILLION medical aesthetics industry? National Laser Institute is your stepping stone to a career as a cosmetic laser tech! In two weeks, you will learn some of the most popular medical aesthetics treatments to tighten skin without using a scalpel such as radiofrequency skin tightening, laser hair removal, tattoo removal, body contouring and more. Our Comprehensive Laser Course combines didactic theory with hands-on clinical training for the ultimate learning experience. In the classroom, you will learn things like hair and skin anatomy, the Fitzpatrick scale for classifying skin typing, laser physics and patient care. During clinicals, you will be broken up into small, intimate groups where you will watch live laser demonstrations and have the opportunity to treat real clients in a medical spa setting. Once you complete one of our medical aesthetics courses, you will have access to our Graduate Services Department, which sends out over 500 job leads per month to our alumni across the country! We want to be there to help you during your job search once you graduate. Prior students have found successful careers working for laser and niche clinics, medical spas, physician’s offices, salons, fitness centers and more! If you would like more information about National Laser Institute’s cosmetic laser courses, fill out the form on the right of your screen or call 1-800-982-6817.